My son Brendan Bjorn is profoundly disabled. He is profoundly deaf in one ear. His care needs are profound. Profound is a word some within the special needs community don’t like to hear. They feel it somehow labels or degrades. It does not. It is a descriptive word that clarifies the level of something. In my son Brendan’s case, profound describes so many aspects of his life and his needs and his challenges. This week, his profound became more profound. For the first time in his 12 years, Brendan has developed 2 pressure sores. I suppose it was only a matter of time, but this has sent my head reeling. He only has 2 positions he can be in because of his many physical and medical issues that have progressively grown worse over the past couple of years. LET THAT SOAK IN. HEAR WHAT I SAID. HE HAS TWO POSITIONS HE CAN BE IN. 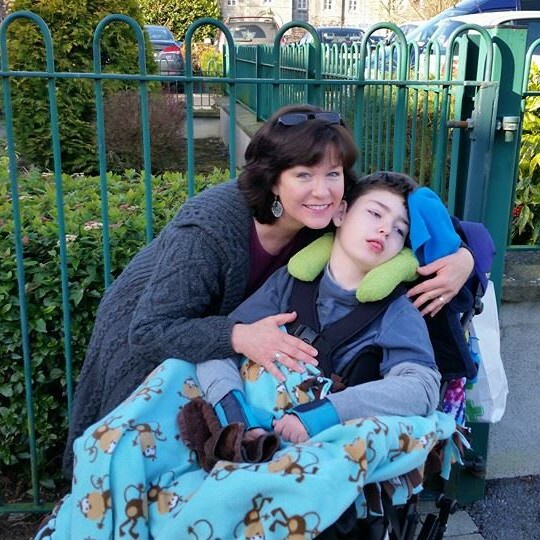 I repeated that because even within the special needs community, there are parents who don’t truly grasp the fragility and complexity and dare I use the word – PROFOUND – level of care concerns Brendan faces. And in that lack of understanding, comes a lack of empathy, yes, even from other special needs parents. Some people just don’t get it. They don’t get that my son now has to take 3 and 1/2 hours just to finish one pump feeding of formula via a peg and that during that time, he can’t be moved or he will vomit because in August 2015, his GI system started the heartbreaking path of refusing to do what it needs to do. They don’t understand that every time I change his nappy now, he begins to gag and often ends up vomiting all over his bed because, you see, if he has soiled his nappy it takes just that few minutes too long to clean him up and his system no longer allows him to lay flatter than 45 degrees. They don’t understand that I can’t just “run down to the shop” to get that bottle of Calpol or litre of milk when I’ve run out because that means stopping the feed, waiting for his gut to settle enough to dress him, then put him in his wheelchair, then loading him into the van…and a good hour or more later, finally go the 7 minutes into the village or 15 minutes into the town. They just don’t understand how profound the entire situation is as a whole. Not many people truly understand – not even many of my friends. And certainly not the politicians who are leaving children, like my son, to suffer on long waiting lists and without proper care; leaving carers, many of whom are also lone parents like me and have no one to lend a helping hand, to barely carve out an existence in what once was a full life. Why don’t they understand? Because they don’t live it. And I think because they really don’t want to know about it. This latest, new issue of developing pressure sores is quite serious. I fully understand what this could mean for him, the restrictions it may place on him until these sores are dealt with, and if any more develop again. Time in his wheelchair being restricted will mean not being at school. It will mean being here at home in his bed with me trying to reposition him ever so slightly as I contend with his left (partially dislocated) hip, his right (bone rubbing on bone) hip, and that all too troublesome GI system of his. And I fully understand what this could mean for me, the exhausted lone parent carer still fighting for respite, as he is restricted even further. The changes are certainly profound. Food for thought: An open letter to the government. I definitely know how you feel. My daughters needs are getting more and more complicated. She is almost as big as me. I am really afraid my back is going to give out someday. I can’t leave her for more than a few hours. The only time I have for myself is when she is in school.